From the Instagrammable blue-lantern-strewn lobby to the pop-art-style funky and colorful rooms, a stay at W Doha Hotel and Residences is an immersive experience from start to finish. 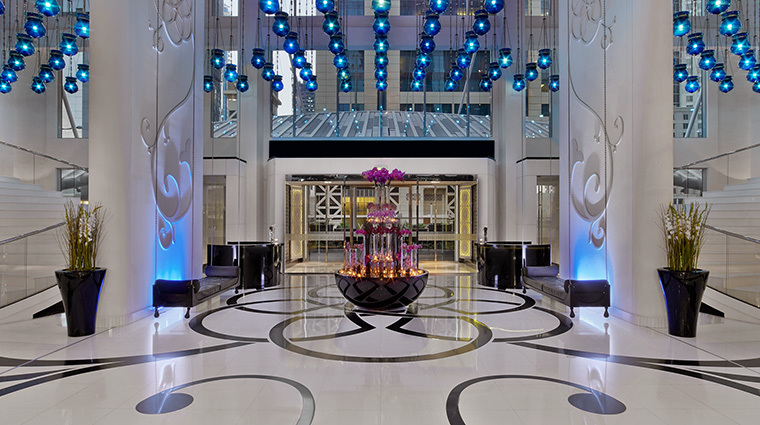 Whimsical and fun, W Doha prides itself on its individual attention to detail, which is evident the moment you set foot in the jaw-dropping lobby. Opened in 2012, the stylish hotel continues to impress with its glamorous W amenities (luxe king sized beds), quirky touches (board games in each room) and its sumptuous Bliss spa. Three luxurious dining venues, including two outposts from celebrity chef Jean-George Vongerichten, and two of the hottest nightspots in the city round out this show-stopping Doha stay. Living up to its “Whatever, Whenever” ethos, W Doha is a service-oriented hotel – staff swarms the lobby to ensure that help is never far away. The in-house Bliss Spa is an urban oasis thanks to a range of muscle-soothing treatments, a cocoon-like interior and a complimentary brownie buffet. Book a Marvelous room category or above to enjoy access to the Executive WIP lounge (W Important Person), the Doha hotel’s version of a club floor, offering breakfast, snacks and even a white grand piano. The property’s West Bay location gives you easy access to the city and its main tourist sights, though you won’t need to leave the Doha hotel to find a great bite. Three restaurants, three lounges and the plush Living Room provide signature sips and delicious fare almost any time of day. The hotel has converted its 29th floor into a gallery space called Art 29, hosting regular exhibitions by local and international artists as well as a pop-up café. 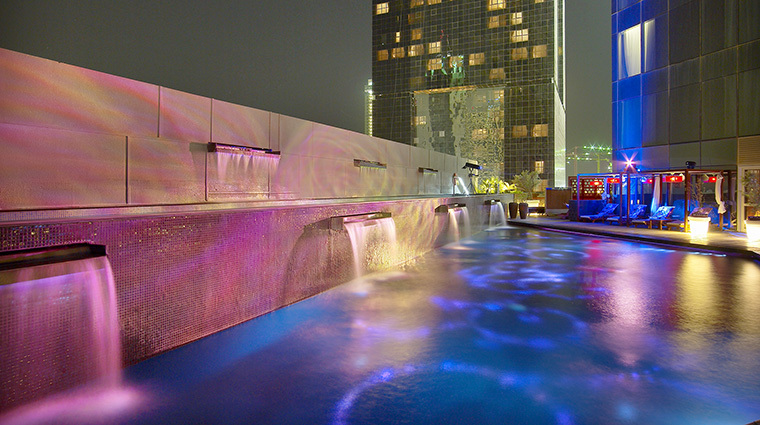 With a luxe nightclub and bar, W Doha is one of the most popular hotels in the city, especially on weekend evenings. As a result, the lobby can become a bit of a zoo, so request a room on a higher floor for some necessary quiet. The pool area may be Miami-esque but it’s small and surrounded by towering buildings, so sunlight, especially in the winter months, can be limited. The hip hotel was originally meant to be an office building, so the hallways can feel a little dark and claustrophobic. If you plan to visit W Doha’s Crystal Lounge nightclub (check out the Baccarat chandelier) or Wahm bar, bring your passport or ID – local rules are strictly enforced. As it ramps up for the 2022 World Cup, Doha is very much a city in progress. The surrounding West Bay area has some new towers and projects still under construction, so expect some delays, noise and not-so-perfect views. Even the entry-level Spectacular Rooms offer a generous 473 square feet while the largest accommodation, the Extreme Wow Suite, tops out at a decadent 3,260 square feet. The Extreme Wow Suite comes with its own aquarium, fully stocked bar and a pool table. Bliss Sinkside Six bath products can be found in all accommodations. These pint-sized amenities promise to give you a spa experience without having to book one. Our pick of the rooms is the Cool Corner Suite, which provides floor-to-ceiling windows and panoramic views of the city’s futuristic skyline. Bathrooms come fitted with a full bath and rainfall shower. Some suites have TVs installed in the mirrors. All-day dining spot Market by Jean-Georges maintains an extensive menu to please all palates, but its Friday brunch, complete with a jazz band and free-flowing cocktails, is the real highlight. Spice Market, another Jean-George outlet, repeatedly tops the city’s best restaurant lists thanks to its well-executed menu of Asian street food. Must-try items include the kitchen’s creative take on sushi as well as melt-in-your-mouth wagyu beef cheeks with yuzu glaze. 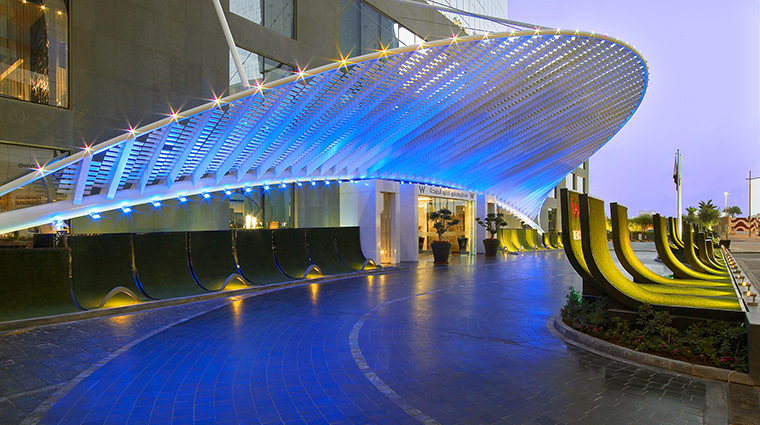 The W Café is a popular meeting spot and serves an excellent fashion-inspired afternoon tea. For a picture-perfect drink, order the rainbow latte. Wahm is a hybrid lounge/restaurant with a clubby interior that opens onto a terrace and shisha bar. Known for its cocktails, this sought-after place also has a menu of solid comfort food favorites (the lobster rolls and mini burgers are house favorites). La Spiga, complete with a now-famous disco ball pizza oven, is an in-demand branch of the Milan restaurant chain Paper Moon. Italian food lovers flock here nightly for its sensational pizza and the Paper Moon pappardelle, handmade pasta bathed in a creamy tomato and beef-bacon sauce.